Over two hundred years ago, working in the mines was a hard and gruelling job, made even harder by severe lighting issues. These lighting struggles created a massive danger to the miners due to gasses coming from within the coal itself which could burn or explode, the miners called this 'firedamp'. This presented a huge problem because a flame could and often did set off an explosion from the firedamp coal. At this time, the only form of lighting available had to come from candles or paraffin oil mining lamps which often caused explosions due to their naked flames setting fire to firedamp gasses. Children still worked in the mines, no mains electricity existed as yet as generators had not been invented, there were no torches as batteries had not been created and there were no light bulbs until over a hundred years after the Industrial revolution. The risk of firedamp explosions or fires caused by candle or oil lamp flames were such a huge fear to miners that many preferred to work in complete darkness. Rotting fish were also sometimes used as a method of lighting as they gave off phosphorescence which had a faint greenish glow to it, but this glow was very poor and the smell, as you can imagine was terrible. Many people were looking for safe lighting which could be used in the mines with no risk of explosions from firedamp and in 1740 a mining engineer called Carlisle Spedding invented a machine which gave of sparks. This machine was very simple and the sparks were created from turning a metal wheel which rubbed against a piece of flint which caused sparks to fly off. Carlisle Spedding called this a 'flint mill'. These flint mills were much safer than candles and oil lamps but were still not completely safe as the sparks could still set off the firedamp causing explosions and the light still remained very poor. Not all mines were troubled by firedamp and for these mines it was safe to use a naked flame. Candle lamps were often used in which a candle was placed inside the lamp. The lamp consisted of metal casings with glass windows stopping the candle from being blown out by drafts and reflecting the light at the same time. From the 1890's Carbide lamps were also used in mines without firedamp and they gave off a much better light than candles. These were small gas lamps that used a chemical called calcium carbide. Water was then dripped onto the chemical to give off the gas acetylene causing it to burn a very bright light. However, the issue of safe lighting still remained for mines with the danger of firedamp as no naked flames could be used. This was when safety lamps were invented in 1813 by William Reid Clanny who was an Irish doctor. Improvements to this safety lamp were then made by Sir Humphrey Davy who was a famous scientist, and George Stephenson who was a famous engineer, this was then showcased to the public in 1816. The safety lamps used paraffin with the flame surrounded by wire gauze, meaning the flame could not get through the gauze because the metal of the gauze cooled the flame down so explosions were avoided. These lamps were much safer than candles and gave off a much brighter light than flint mills but unfortunately these safety lamps still had their problems and would become dangerous as they got old or damaged in the mines due to rust or accidents and could still set off explosions. As miners started to use safety lamps they soon discovered that these mining lamps could also be used to detect firedamp by the way that the flame in the lamp burned, they could tell if the explosive gas was present or dangerous. Safety lamps became extremely useful for detecting firedamp and were used for many years on for this particular reason. Electric lighting then became available and was introduced into the mines in the 1990's. 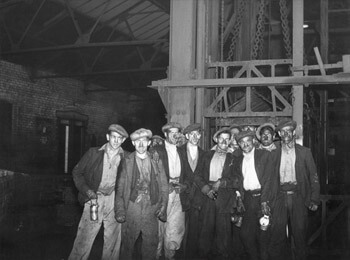 This began with fixed lights to the walls with miners still having to use their own safety lamps to see properly until 1930 when battery powered torches were introduced. These battery powered torches were a huge improvement for the minors and consisted of a battery pack that was connected to the lamp which miners either held or wore on their helmets. 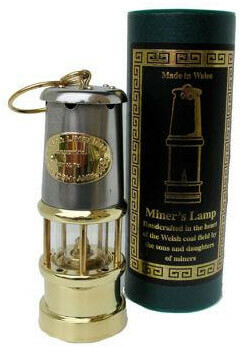 Since the early 1800's, Welsh mining lamps have been available in lots of different styles and sizes. Not only are they traditional and functional but they make fantastic ornaments and gifts. Our miners lamps are genuine working replicas, hand crafted in the heart of Wales available in many different popular styles and materials including steel, brass, copper and nickel plated lamps. Each one of our Welsh miners lamps come in an attractive presentation tube with instructions provided to ensure they are used safely. Purchase a piece of mining history straight from Welsh gifts today.